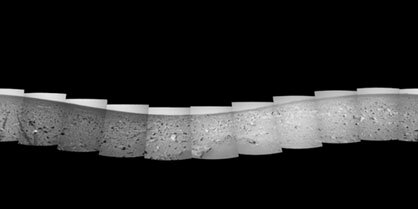 This 360-degree navigation camera mosaic was taken by Mars Exploration Rover Spirit on March 9, 2004, after a drive that brought the rover to less than 20 meters (66 feet) from the rim of the crater nicknamed "Bonneville." The vista provides a glimpse of the far side of the rim. 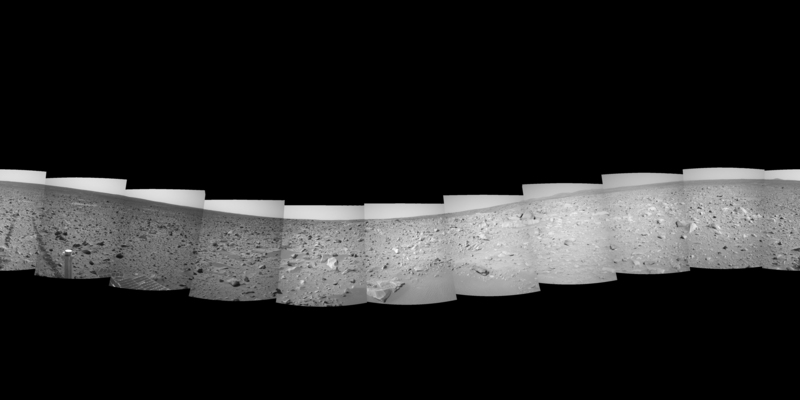 It also includes a close-up look at a 1-meter-tall (3.3-foot-tall) rock called "The Hole Point," which has served as a beacon for scientists and rover operators in guiding the rover toward the crest of this rim. Scientists are anxious for Spirit to get to the very edge of the crater rim and peer down inside. From that vantage, Spirit will examine the floor and walls of the crater, where layers may be exposed that are older than the surface material on the terrain outside of the crater.